To a Frisian breed, a Frisian name is appropriate. Friesland is a province in the Northern part of the Netherlands, but we live in Brabant, a province in the southern part of the Netherlands. We wanted our kennel name to somehow show where the roots lie of the puppies born with us. I think we succeeded by choosing for fan'e Sudewyn, a Frisian name wich is translated in English as of the south wind. We think it's important to know all that there is to know about breeding, so that's what we've been trying to accomplish since early 2004. I took courses in breeding and canine knowledge, and I am a certified show judge for the Stabyhoun and the Wetterhoun. The hunger for even more knowledge is insatiable so we keep on studying genetics, the breed and other related subjects. Our kennel is acknowledged bij the NVSW, the Dutch breed association. the puppies will be vaccinated, treated for worms and will be given the European passport for companion animals. 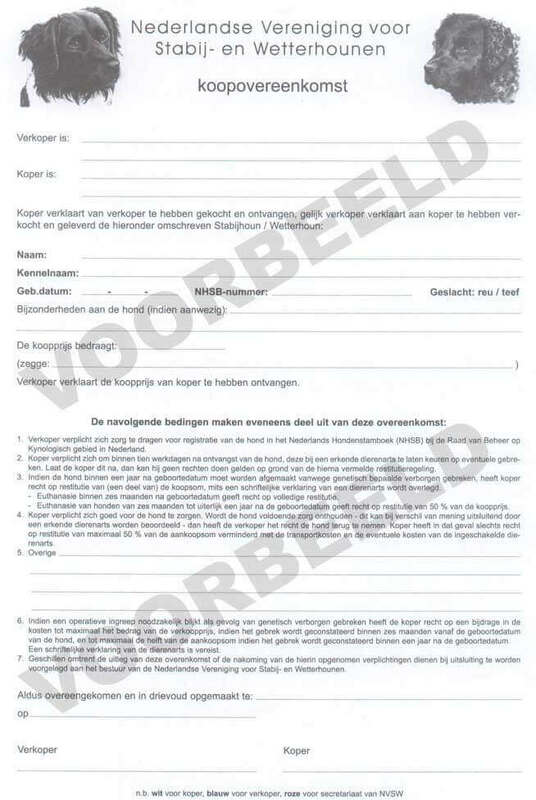 a contract of agreement (issued by the Dutch Stabyhoun Association) will be drawn wich specifies the rights and obligations of both the future owner and the breeder. 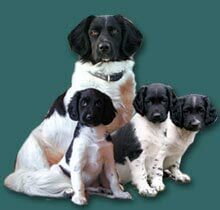 we will spend a great amount of attention and time on socialising the puppies with all kinds of domestic and less common situations and noises. A dog will be living with you for a significant part of your life, and you will be the most significant thing in its life. It is therefore of great importance to you both that your characters and lifestyle match. For instance, a somewhat timid dog needs a gentle leader, such a dog would not prosper and could even cause problems in a busy and turbulent household. In contrast, an audacious dog with a dominant personality, is better off with someone who's got the ability to be firm and consequent, and a person like that would probably not be very happy with a submissive and abashed dog. You need to know what to expect. In other words: choosing a Stabyhoun is more than just counting spots. During the 8 weeks the puppies are with us, we shall observe them carefully and consider which character suits which future owner best. Of course, there will be deliberation with the future owners, but the final decision is ours. From experience I can tell you that ultimately, it doesn't matter how your doggy looks, within 2 weeks it's definitely the sweetest, most beautiful and wonderful dog you have ever known!